Hostname is a label that is assigned to a device connected to a computer network and that is used to identify the device in various forms of electronic communication such as the World Wide Web, e-mail or Usenet. Keyword hostname followed by name will set the hostname temporarily. 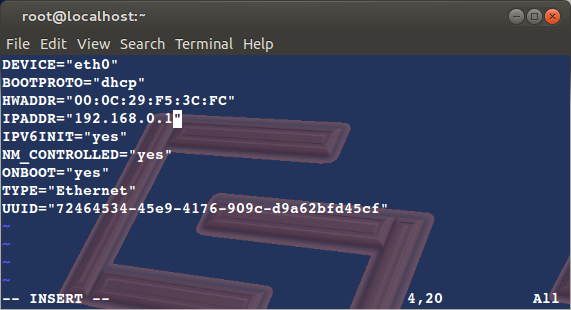 The new host name can be checked with the command hostname. To survive the reboot, you need to make some changes in the /etc/sysconfig/network file. As shown in the above screenshot, just change the HOSTNAME field as required. Also if you have entries in the /etc/hosts file, make sure you make proper changes in the file. Change your old hostname to the current one; like its localhost to host1.coolcoder.com in this case. Now, restart the network service or reboot depending on whether its a client or server system. The IP address of any particular interface can be changed temporarily using the ifconfig command. To change the IP address of any interface permanently, you need to make changes to the interface related file under /etc/sysconfig/network-scripts. For example, for interface eth0, the file will be ifcfg-eth0. Modify the ifcfg-eth0 file and change the IPADDR field accordingly. Also, if you have any entries in the /etc/hosts file, make sure you make the changes accordingly.